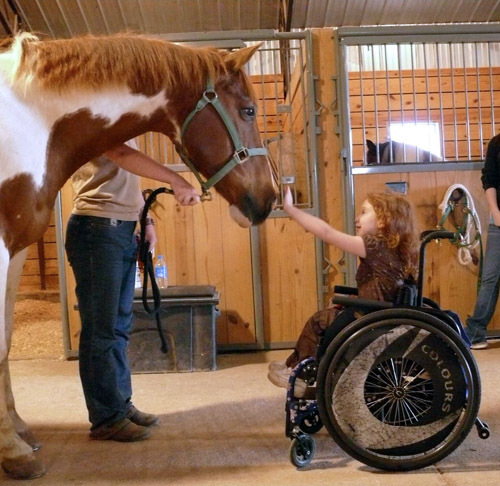 is a treatment that includes equine activities and/or an equine environment in order to promote physical, occupational, and emotional growth in persons suffering from ADD, Anxiety, Autism, Cerebral Palsy, Dementia, Depression, Developmental Delay, Genetic Syndromes (such as Down Syndrome), traumatic brain injuries, behavioral issues, abuse issue, s, and many other mental health problems. Equine Therapy can help the individual build confidence, self- efficiency, impulse control, communication, perspective, social skills, trust and learn boundaries. Since the horses have similar behaviors with humans, such as responsive and social behaviors, it is easy for the patient to create a connection with the horse. What Does Equine Therapy Do? Builds positive goal attainments skills. Creates a sense of accomplishment. Redirects a child’s behavior in a positive, peaceful environment. Please donate today!